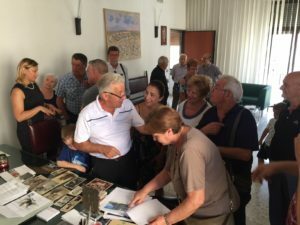 Lorraine Petrulli, second from right, talks about family history with the mayor of Essweiler, Germany at right and the local historian, center left. This was during her visit to her ancestral village on Sunday, June 24. 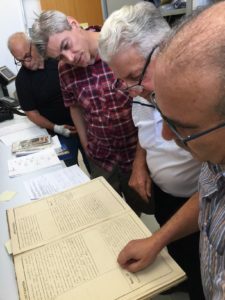 NBC News sent a crew from the United States and from London to cover 36 hours of our visits to Heidelberg and Essweiler, Germany this June 23 and 24. 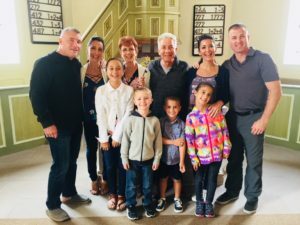 It was a thrill to have the team from NBC capture the excitement and wonder of this long-awaited 50th anniversary trip for Dominick and Lorraine Petrulli along with their two daughters, two sons-in-law and four grandchildren. Then it was the “Big Day.” We made our way in two vans for the family of ten, plus a van with equipment and the crew who had flown down from London. 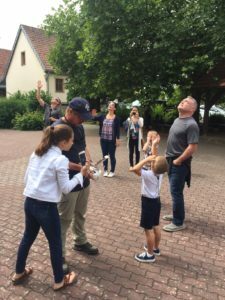 The producer, Joel Seidman, and the reporter, Kevin Tibbles, rode in a car at the back of our little parade from Heidelberg to tiny Essweiler, Rheinland-Pfalz. 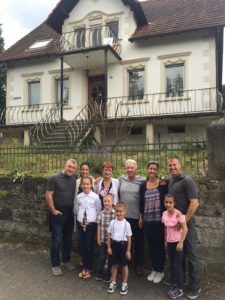 Lorraine’s grandfather, Alexander Jung, was born in this hamlet and the house where he lived still stands. We were able to take photos outside that house, and Lorraine met the current occupants (no relation). We saw the old church, dating from the late 1700s, and the caretaker let the grandkids ring the bells. That’s pretty unusual in a small town in Germany, because the bells ringing at any other time than church service means there is a fire or other emergency. 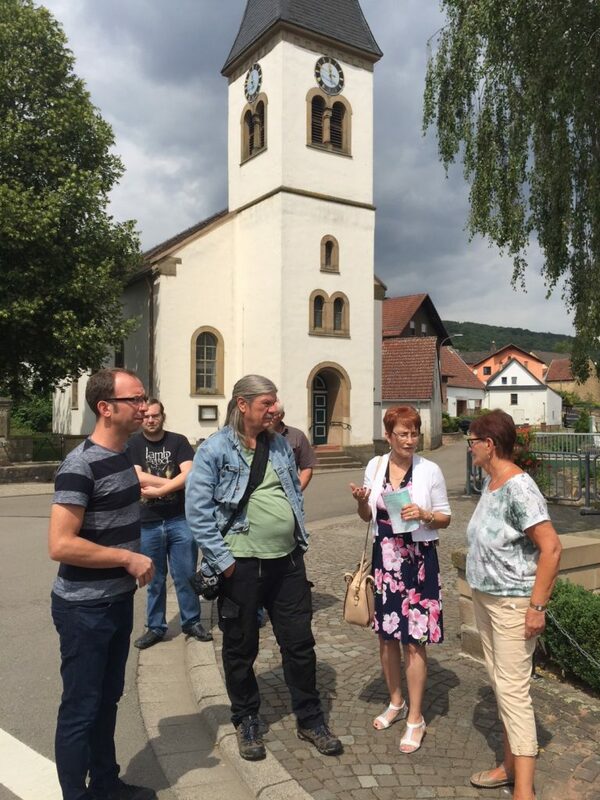 NBC followed us over to Burg Lichtenberg where there is a museum dedicated in part to the wandering musicians from Essweiler and the area. Lorraine’s grandfather was one of those wandering musicians. There was a medieval festival going on, which was fun for all. NBC filmed quite a bit of that, too, but it didn’t make the final cut of the story. 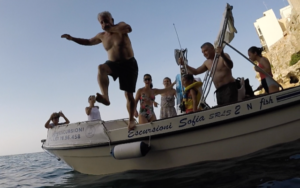 It was wonderful that we werer able to get some Go-Pro footage taken by Taylor Searing, daughter Daniel’s husband, into the story. This made the story a rounder version of the entire trip, with both Dominick and Lorraine’s family represented. 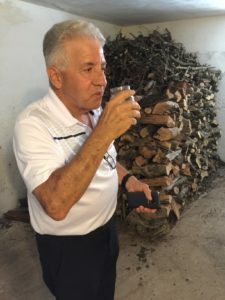 The photos below tell more of the story. To watch the NBC segment, click here. 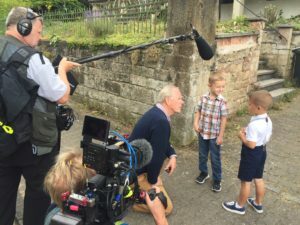 NBC News reporter Kevin Tibbles asks young Tyler Kahn and his cousin Jackson Searing about their visit to the village of Essweiler, Germany. Tyler replied, “Because my great-great-great-great=great-great grandmother lived here.” A few too many “greats” but we got the point and had a good laugh. In from of Alexander Jung’s house, built in 1930. 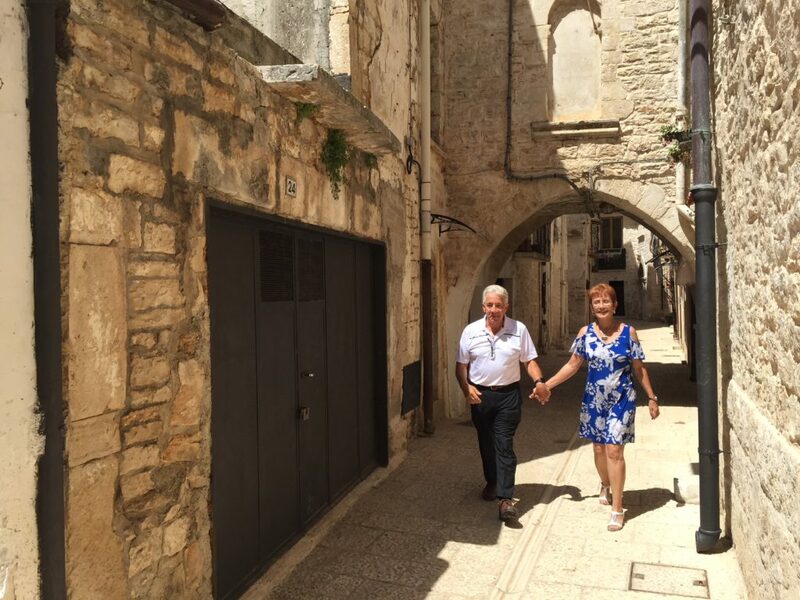 Dominick and Lorraine walk through the medievel center of Bitetto, Bari, Italy. This is where Dominick’s ancestors came from before emigrating to New York. 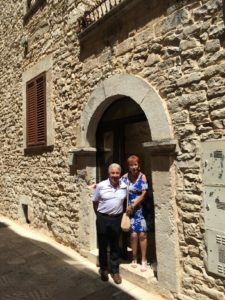 Dominick and Lorraine Petrulli in the home of Francesco Petrulli. The house dates back to the 1600s. 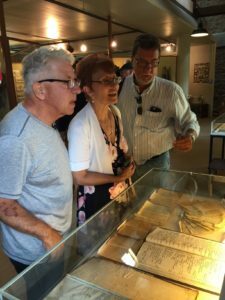 Posted in Europe Tours, Family History Tours, Germany Tours, Italy Tours and tagged 2018, 25, ancestors, ancestry, august, derheim, essweiler, germany, james, nbc, news, nightly, petrulli, tour.